Here are just six reasons why you should own wooden earrings. Wooden earrings will go with any outfit, whether you are going for down-to-earth casual, natural glamour, professional style or understated sophistication. Precious metal and gemstone earrings are great for evening wear or going out at night, but can sometimes make it look like you are trying too hard if worn during the day. The beauty of wooden earrings is that they allow you to express yourself and make it look effortless. Wooden earrings give you more flexibility and can help ease the transition from day to night. As wood is a natural material, its grain and shade varies. By buying earrings made of wood, you are purchasing unique jewellery as no two sets of wooden earrings are exactly the same. In 2010, it is less about drawing attention to yourself by wearing mismatched, oversized or statement jewellery and more about drawing your look together with complementary, matching and subtle designs. With a range of colours and shapes available, wooden earrings can be used to emphasize certain colours in your clothing and bring the whole look together. With the price of gold rocketing, designers and fashionistas are turning to more natural materials and wooden earrings are very on trend in 2010. Our collection of wooden earrings are made from sustainable wood, meaning they are eco-friendly. Fashion does not have to be a trade off between style and caring for the environment - our wooden earrings give you both. Another benefit of wooden earrings is that they are lightweight. Even if you have a penchant for oversized wooden earrings, you can almost forget that you are wearing them. Whatever your style type, Arctic Fashion stock a variety of versatile wooden earrings - read on for more details or click here to buy wooden earrings. These naturally elegant wooden stud earrings are ideal for work. Weighing less than 2 grams, Marja wooden stud earrings offer hassle-free style. 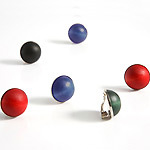 Add a splash of colour to your ear lobes - these stud earrings come in a variety of colours. 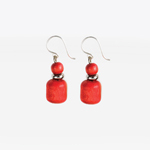 Bright and glamorous wooden earrings for those who like attracting attention. 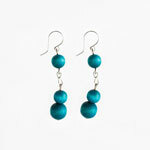 These long wooden earrings have three turquoise beads and weigh just 4 grams. Also available in black. 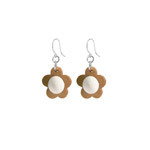 Delightfully feminine earrings with flower-shaped wooden charm. Made from sustainable wood from Scandinavia, these designer wooden earrings come in brown/white and black. Matching necklaces and brooches are also available. These wooden earrings combine two of this season's trends for brown and tan colours and jewellery that tones with your outfit. 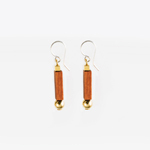 Oulu wooden earrings have an brown oblong wood bead held in place with two gold coloured beads and silver hooks. Subtle, but striking wooden earrings like these are going to be big in 2010. With a central coloured wood bead set in silver coloured square, the Foxi wooden earrings are eye-catching without being overpowering. Available in red, purple, black and green while stocks last. Get style and sophistication with these long wooden drop earrings. At just 4 grams, Masurkka purple earrings are much lighter than their metal equivalent. The disc-shaped wood beads hang down 35mm from the hook. Dual bead wooden earrings available in striking red or cool purple. Etydi earrings help liven up darker outfits and lift your mood. Matching wooden necklaces and bracelets also in stock. These are the ultimate power dressing earrings. For ladies with non-pierced ears, these wooden clip on earrings offer simple style. Each Turku clip on earring has a 2 cm diameter wooden pearl. Tempted? Buy your wooden clip on earrings now in black, blue, green or red. 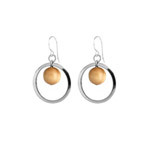 A striking set of wooden earrings with wood pearl, surrounding metal hoop and silver hooks. Hitti wooden earrings come in warm middle brown, sophisticated black or more vibrant aniline red. Make a statement with these oversized wooden drop earrings. 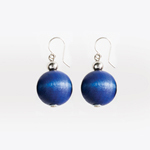 There are three colours of Pallo design available - take your pick from red, blue or black wooden earrings. 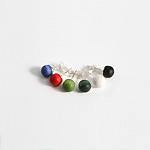 Designer wooden earrings with two coloured wooden beads and silver hooks. Available to buy in vibrant red or striking purple. These wooden earrings go well with the Polkkis necklaces. 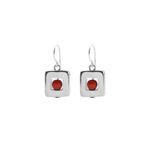 Share the love with these beautiful Finnish designer earrings. With silver hooks, Romance earrings have a coloured wood pearl and metal heart charm. 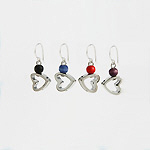 Choose from purple, jeans blue, black or red heart earrings. Matching bracelet available. from within UK or dial +441256362545 if you are calling from outside UK.